An amulet, a treasure hunt, and a legion of readers mobilized by the false patterns our brains create to make sense of the world around us. Jess Zimmerman is the editor-in-chief of Electric Literature. From Masquerade by Kit Williams. There were more and more signs every time Ron Fletcher went to Rodborough Common. First, he found empty bottles of Haigh whiskey under a hawthorn bush—Haigh, like Haigha, the name of the March Hare in Lewis Carroll. Hare. There were more in the trash bin, along with bottles of Idris lemonade—when he took them away, they replenished themselves as if by magic. Of course, someone could be a heavy drinker of whiskey and lemonade, but everyone knows Idris is an ogre in Welsh mythology, and he plays a harp, and the trash bin was near a bench dedicated to one Fred Harper. It all connected. Ron found nothing in the hole in the tree with the blue ribbon—a blue ribbon just like the one on the Penny-Pockets Lady’s apron in the book—but on the bench he found a letter. It seemed to be a love letter from a man to another man, but that was only a front. The connections were clear. He responded in Latin, left his answer in the hole in the ribbon tree, and rushed home to tell the author that he was still hot on the trail. Afterwards, on the way to the pub, he checked the names written on the sides of vans, looking for the author’s response. He hadn’t sent the letter yet, but he didn’t have to; the new clues often came before the letter was received or even mailed. He had finally realized that the author possessed a listening device that could detect vibrations from his typewriter keyboard. His friend Chris at the pub was in on it, too—it was obvious from the way he hinted that Ron’s name “Fletcher” had something to do with butchers. There was a pig in the book, after all, a massive sow. Chris was Norwegian, and a flitch of bacon in Norwegian was “flesk,” but “flekkr” meant flicker, and flicker meant Morse code, or Flicka the horse from the film. It connected. Everything, everything connected. 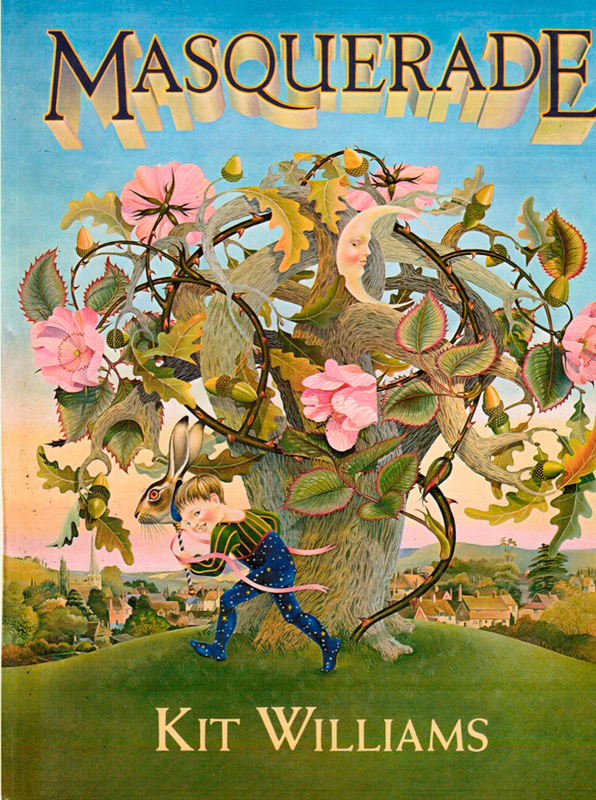 At first glance, the 1979 book Masquerade is a rather lightweight fable about Jack Hare, who is entrusted by the Sun with a precious jewel that he proceeds to lose almost immediately. The text is studded with simple riddles of the Bilbo-versus-Gollum variety, but otherwise doesn’t really invite a reread. More interesting are the illustrations: lavish, lovely, and intricately detailed, each one bordered with an enigmatic series of words. It makes sense that Masquerade’s illustrations would be more impressive than its text; the author, Kit Williams, was a painter by trade, and had never written a story before. Then again, Williams was usually immediately, astonishingly successful at anything he tried, and his first crack at a book was no exception. His publisher had talked him into the idea by saying “I think you could do something no one has ever done before,” and it proved to be a prophetic dare. What made the book so innovative, and ultimately so popular, was that it wasn’t just a book. It was a treasure hunt. Within Masquerade’s covers were clues that pointed the way to an actual buried treasure: an intricately-worked golden hare, also made by Williams, in his typically perfect first attempt at goldsmithing. The prize was somewhere in England and the directions to find it encoded in the book, and that was all anyone knew. It was enough. Masquerade sold two million copies in the first few years, and readers went mad—sometimes literally—trying to suss out the location of the golden hare. Based on hunches, resonances, illusory references, coincidental results from imagined codes, and genuine mistakes, “Masqueraders” dug up acres of countryside, traveled hundreds of thousands of miles, wrote tens of thousands of letters to Williams, and occasionally got stuck halfway up cliffs or were apprehended by police while trespassing on historic properties. Masquerade’s simple, elegant puzzle was couched in a lush landscape of visual symbolism and wordplay, and as it turns out, there’s no better way to distract people from a genuine plan than by concealing it inside a bunch of random noise. Given enough unrelated, unnecessary information, human brains will construct the decoy patterns all by themselves. In 1958, German neurologist Klaus Conrad coined the term Apophänie to describe schizophrenic patients’ tendency to imbue random events with personal meaning. An apophany has the form factor of an epiphany—the sense of breakthrough, of events finally coming together and making sense—but without any relationship to real explanations. But though Conrad focused on instances of apophany occurring with psychosis, the phenomenon he described applies to the ill and the well alike. Now called “apophenia,” the instinct to pick out patterns from meaningless information is essentially universal. When you look at a rock formation or a car grille or the moon and see a face, that’s a form of apophenia—pareidolia, the construction of coherent visual or auditory stimuli from noise. The Rorschach test: apophenia. Horoscope adherents who see correlations between their star charts and their lives or personalities are engaging in apophenia too. When several unrelated things go wrong in a single morning, it’s apophenia that tells you that you must be dogged by a curse. Most attempts to anticipate what will make newborns stop crying are tinged by apophenia. And if you know anyone who’s convinced herself she has food sensitivities she doesn’t have, based on a supposed pattern in how she feels after eating, feel free to tell her she suffers from apophenia (though you shouldn’t expect it to go over too well). Like many other cognitive biases, pattern-finding makes us feel better. Apophenia is also, as Conrad noted, a feature of some mental illnesses; in the grip of a psychotic episode, mundane events and objects take on a false corona of significance. And then there are the cases that lie in between everyday self-deception and outright derangement: conspiracy theories, benign delusions, and (many would say) religious experiences. The instinct for pattern is an instinct for sense and stability, a desire to believe that what you’re encountering is explicable. (If, perhaps, not plausible; we greatly prefer the preposterous to the chaotic.) For most Masquerade maniacs, this was where their obsession fell: in the no-man’s-land between humdrum reality and hallucination, in the space where we search for meaning. Some searchers were spurred to new creative heights: Michael Savill decided that a pun in the text about a “hare-loom” was a clue that the answer would be found in weaving. After discovering that a type of weaving called a “two-two weave” can be used to form letters on the finished product, and remembering that one of the characters in the book is wearing a tutu, he devoted himself to learning the craft, sure that the answer would be found by weaving a length of cloth that would spell out the location of the hare amulet. He used lighted and unlighted windowpanes in one of the illustrations to work out a card-weaving pattern, and had generated twelve feet of fabric by the time the hare was found. Others suspected patterns even more far-reaching. Ron Fletcher, the one who thought Williams could eavesdrop on his typewriter, believed the author was merely a front for a massive conspiracy that went all the way to the top: “It has to involve the royal family. In particular Prince Michael of Kent. But higher than that too,” he told Bamber Gascoigne, a British TV presenter who wrote a book on the Masquerade phenomenon. “If you really want to know, it has to involve the Queen. It has to go as high as that.” Richard Dale cast Masquerade and its author in his own pre-reality-TV version of the Truman Show delusion: “I convinced myself that Kit Williams’s book was a media masquerade—performed in print, on television, involving perhaps hundreds of people in every country where the book has been published. The biggest masquerade in the history of mankind.” Dale eventually became so overwhelmed by his Masquerade fixation that he sought psychiatric help. Why are we so instinctually inclined to find connections between unrelated images or events or ideas? It may simply be that, like many other cognitive biases, pattern-finding makes us feel better. The fundamental randomness of the universe is chilling to contemplate. Any indicator of consistency and predictability is a comfort—so, if such a thing can’t be found, we apparently make it ourselves. And the more disempowered we feel, the more we are reminded that both bad and good fortune are overwhelmingly arbitrary and out of our control, the more we are inclined to impose our own imagined patterns on the terrifying senselessness of the world. This makes intuitive sense; how often are conspiracy theories devised to explain why things are going so well? Indeed, people’s likelihood of believing in conspiracies tracks with feelings of powerlessness, low self-esteem, and lack of control. This is surely due in part to the need to scapegoat one’s misfortune; anything that’s the fault of the Illuminati probably isn’t your fault too. But perhaps it’s also a symptom of our instinct to impose order. Perhaps the person who looks at the U.S. government and sees the influence of Lizard People is kin to the one who looks at a hare’s tale and sees a parable about diabetes or weaving or God. Would Masquerade have made such a splash if it hadn’t come at the cusp of the Thatcher era, close on the heels of England’s so-called Winter of Discontent? (A Masquerade fanatic could surely find a connection to Richard III somewhere in its pages.) Was the country, and then the world, simply starved for a sense of control? It could be. Certainly none of the puzzle books inspired by or imitating Masquerade were able to capture imaginations in the same way, despite many of them offering much bigger prizes. Then again, other pop culture platforms for spurious pattern-finding have been even more popular; every episode of Lost, for example, had many times more viewers than Masquerade had readers. It’s likely that Masquerade would have attracted followers no matter the economic era. The void of meaning is always with us, after all. There’s no shortage of anxieties to salve. The resting place of the hare is now public knowledge. It was buried in Ampthill Park, in Bedfordshire, near the monument to Catherine of Aragon, at the spot where the tip of the monument’s shadow touches at noon on the equinox. You can easily find out how the book led to this solution, if you don’t want to try to work it out yourself; it’s explained in the endnotes to the paperback edition, and in Gascoigne’s delightful (though tragically out of print) book Quest for the Golden Hare, and online. I won’t tell you here. I’ll just mention what most Masqueraders might have realized, if they’d sat down and thought about it: There is no guesswork involved. The puzzle is consistent, predictable, unambiguous, and all the necessary information to solve it is contained within the pages. It involves a very precise algorithm worked on every painting, and an acronym. The solution does not rely on far-flung researches in history, astronomy, literature, dream interpretation, zoology, or mysticism. There is no word association, there are no homonyms or deliberate misspellings (though there are a few accidental misspellings in the illustrations; Kit Williams is effortlessly talented at everything except orthography). Masquerade was not random noise. It was a carefully wrought conundrum, built with elegance and precision. It was, in fact, very much the opposite of the woolly, haphazard solutions that devoted Masqueraders had wrung from the book’s allusions and imagery. But a rigorous search for the most unambiguous solution would be an exercise in frustration, dead ends, hypotheses discarded as soon as tried. The nebulous, associative, catchall approach offers so much more comfort, so may more chances to impose meaning, to feel everything clicking into place. Epiphany is hard-won; apophany gives you the same rush, the same feeling of security, but without the struggle. Sometimes, by chance, the patterns the brain makes to soothe itself get us almost as far as truth. Cracking a code is a learnable skill, but finding a pattern in cacophony is an instinct. Williams famously said that a bright child of ten could pinpoint the treasure, meaning that no great education is necessary, but it’s a rare child who would be able to slice through the imagery padding the book to reveal the clockwork mechanism at its heart. It’s much more natural to be distracted by the wealth of visual information, and the panoply of solutions it suggests—all of them miles from the actual answer, but more ornate and wide-ranging and therefore, ironically, more intuitive. In the end, only two people actually solved the Masquerade puzzle—and they didn’t find the hare. It had already been retrieved, by a man following a web of associations just as haphazard as anyone else’s. Thompson fired off a map of the area to Williams, and commenced digging along a line starting at the memorial and heading north. No luck—but a phone call from the author confirmed that he was on the right track. Then, on one of his expeditions, he saw an area, slightly apart from the line he was investigating, where the earth had been disturbed. Digging there at night turned up nothing, but returning in the daytime, he found an earthenware casket in the shape of a sitting hare. In the dark, it had blended into the dirt and been overlooked. The golden amulet was inside. In fact, the verse on the rock was a lucky coincidence, the other cross was irrelevant, and the answer was far more precise than “dig around near the memorial until you find it.” “One of six to eight” was indeed a clever reference to Catherine of Aragon, but that was mainly for Williams’ own amusement; anyone who solved the puzzle thoroughly would have known exactly where to dig, without having to make intuitive leaps from cryptic allusions. And the disturbed earth? That, it later became clear, had been turned over by the only Masqueraders to correctly solve Williams’ puzzle, physics teachers Mike Barker and John Rousseau. Barker and Rousseau had also missed the hare in their first attempt, but before they could return, their hastily covered excavation put Thompson on the right track. They had come both too early and too late. If Thompson’s story sounds fishy to you, you’re not alone. Six years after the hare was found, the London Sunday Times printed a story disclosing that Thompson’s business partner was dating Kit Williams’ ex-girlfriend. According to the Times, the ex-girlfriend knew the basic location of the treasure but not the solution to the riddle, and she handed that information over to Thompson and his partner in exchange for a promise that they would donate the profits to animal rights. Perhaps this is true. (The ex-girlfriend denies it.) But consider that Thompson was not the only Masquerader to end up in Ampthill Park by following entirely the wrong thread. Peter Ormandy had fetched up within 20 feet of the prize, thanks to a web of connections that included a nonexistent code, the wrong wife of Henry VIII, Old English etymology, and some fancy interpretive footwork (his imaginary code returned the result “PHD HE LIE,” which Ormandy believed referred to a headstone with a cross; Ph.D. = philosopher = Jesus and “he lie” must mean “in the grave”). Though his ultimate solution would not have yielded the hare without an enormous excavation, Ormandy got closer to it than anyone besides Thompson, Barker, and Rousseau—despite the fact that none of his key clues had anything to do with the real solution. Sometimes, by chance, the patterns the brain makes to soothe itself get us almost as far as truth. Others took Thompson’s success and the ensuing media coverage as another set of clues, and incorporated these into the patterns they’d already devised. They noted, for instance, that “Kit Williams” anagrams to “I will mask it,” and Dugald Thompson’s pseudonym for the press, “Ken Thomas,” anagrams to “the mask on.” Hopeful hunters were still out digging for months after the hare was found. Thirty-three years later, there are probably still some who believe it wasn’t. It’s no surprise, really. The hare was never the point. Or rather, the hare itself was not the point; as one seeker from Texas wrote, “Where would I ever wear such a thing anyway? What would the cashiers say about me after I left K Mart or Safeway?” The point was finding—finding the connection, finding the pattern, finding the clue that makes it all fall into place. Finding the explanation that forces chaos to cohere into meaning, that staves off nihilism for one more day. The addictive thrill of apophany. For one person, the treasure of Masquerade was a piece of gold. For hundreds of thousands of others, the treasure was meaning—the belief that, for a little while, within specific boundaries, everything could make sense. And while the hare could only be found in one place, meaning can be found in many. You’ll probably have to put it there yourself, of course, but then again, that’s easy. That’s what we do. Speaking with the author of Girl in the Spider’s Web about class, mental illness, and making yogurt interesting.